For Jop Vissers Vorstenbosch (1986, Veghel) and Tim Breukers (1985, Breda), sculpture and painting are very stretchable concepts. In their young oeuvres they push the boundaries of these disciplines with humor, banality, knowledge of traditions and technical ingenuity to defy the existing conventions. A spatial work can suddenly become a painting and sculptures can become two-dimensional by use of collages. 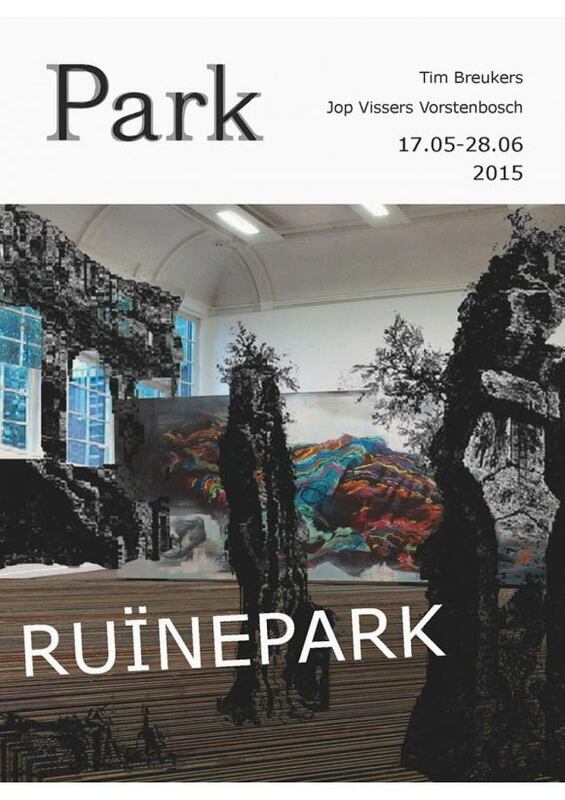 In 'Ruïnepark' (Ruin Park) the two artists transform PARK's monumental space in an energetic, playful and humorous way. 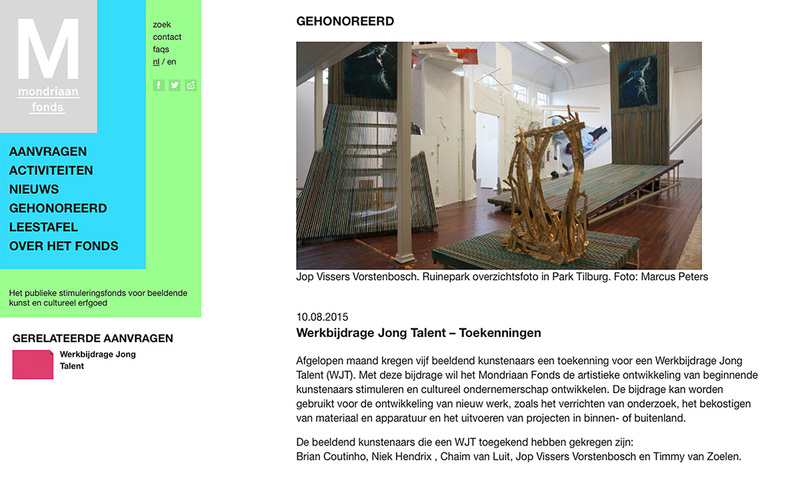 The show is opened on Saturday 16 May 4 pm by Loek Grootjans, artist and philosopher. Jop Vissers Vorstenbosch (1986, Veghel) makes abstract paintings and strives to present them in an unconventional manner. He wants to involve the viewer physically by having his paintings open a dialogue with the architecture in which they are presented. 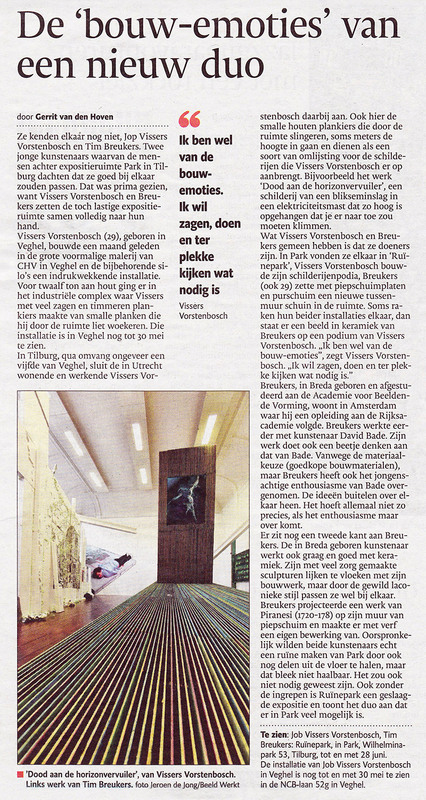 Vissers Vorstenbosch wishes to challenge the gaze of the viewer. He believes that watching a painting often is a passive act. To break the conventional viewing habits he affects walls and floors with rhythmic wooden frames in which his paintings are placed. The painting and the spatial intervention form a whole. "I work like a lumberjack when I'm painting. In advance I make decisions and gather what I need. In doing there is no way back. The hefty blow, there is no room for correction. Painted hits I select, they have the right to exist. What remains is destroyed." 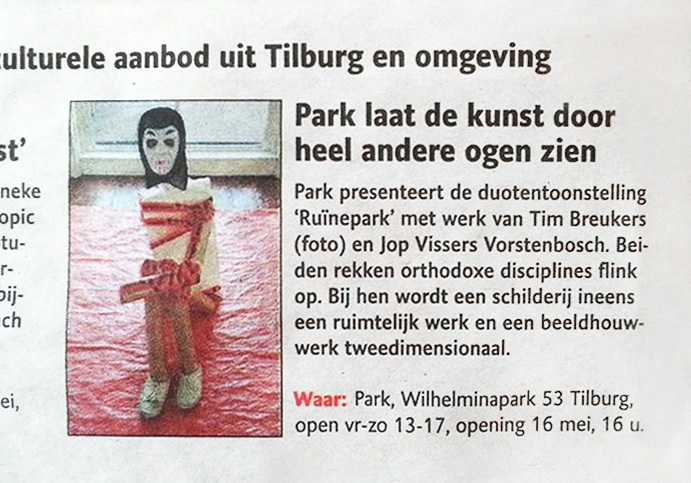 Tim Breukers (1985, Breda) works at the crossroads of classic, technically ingenious sculpture and art in which banality and everyday life play a role. He seeks to stretch the limits of traditional sculpture, but at the same time subjecting elements from pop culture to a solemn sculptural treatment. "I want the material to speak. How it drips, breaks, tears or deforms. As if it wants to destroy. I use the danger of collapse to bring tension to the image." In his collage books Breukers is looking for ways to free himself from the restrictions of the medium of sculpture. Ideas are given free rein on paper to mature and then they can be easily edited. Although the three-dimensional quality of a sculpture is absent at the colorful pages, the illusionistic forms show a fascination with the potential of spatial objects.